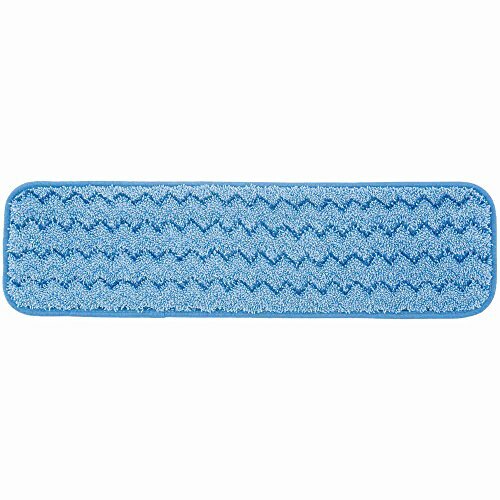 Rubbermaid Commercial FGQ41000BL00 HYGEN Microfiber Room Mop Pad, Damp, Single-Sided, 18-Inch, Blue. Premium split 3-5 micrometer nylon / polyester blend microfiber cleans 45% better than string mops and 25% better than conventional microfiber. Zig-Zag design packs 17% more split microfiber into each mop. Hook-and-loop pads attach securely, but easily replace or switch pads. Double-finished edges retain mop shape with use over time. Tough 3rd party-tested construction stands more than 500 launderings, 200 with bleach. Color-coded blue for general purpose cleaning in low-risk areas. LEED point-qualified.18.5 inches long by 5.5 inches wide by 0.5 inches high. 0.247 pounds. Imported. Premium split 3-5 micrometer nylon / polyester blend microfiber cleans 45% better than string mops and 25% better than conventional microfiber. Zig-Zag design packs 17% more split microfiber into each mop. Hook-and-loop pads attach securely, but easily replace or switch pads. Double-finished edges retain mop shape with use over time. Tough 3rd party-tested construction stands more than 500 launderings, 200 with bleach. Color-coded blue for general purpose cleaning in low-risk areas. LEED point-qualified.18.5 inches long by 5.5 inches wide by 0.5 inches high. 0.247 pounds. Imported.